What Do Guys Look for in a Girlfriend & Long Term Relationships? How Can I Make My Girlfriend Feel Good About Herself? A person lacking confidence needs help to celebrate achievements. Confidence and self-esteem are the building blocks of a healthy outlook on life. When a person lacks confidence, it can be difficult to try new things, meet new people and feel good about accomplishments. Helping someone with low self-confidence involves more than a pat on the back. Consistent support and encouragement are needed to help boost low self-esteem. If you know someone who lacks confidence, there is much you can do to help encourage a more positive outlook. A person who lacks confidence may shrink from his accomplishments. You can boost his self-esteem by offering praise, both for what he has achieved and also for his efforts when he failed, according to the American Academy of Pediatricians' article "Ways To Build Your Teenager’s Self-Esteem." For example, if your friend aced his chemistry exam, say something like, "Wow, you must really know your stuff!" Those with low self-confidence tend to believe their successes are due to luck or chance rather than skill or ability -- so be sure to point out how his hard work paid off. 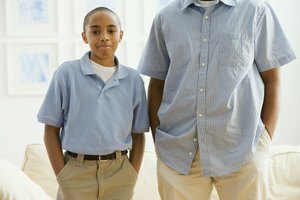 Get him involved in activities that build self-esteem. Have your friend join you volunteering at the local food bank, ask him to take an art class with you or take up golf together. Developing skills will give him a sense of mastery, writes psychiatrist and author Dr. Neel Burton in the article "Building Confidence and Self-Esteem" on Psychology Today's website. Challenge your friend to set achievable goals that you can both work toward together -- such as running a 5k race or becoming proficient in a second language. As he learns new skills and gains new experiences, his confidence will blossom. A person who lacks confidence needs a role model who can show her a different way, writes Irene S. Levine, psychologist, in the article "Five Ways Friends Help Build Our Self-Confidence," on Psychology Today's website. You can be that positive example by modeling confident and assertive behavior. For example, if your friend observes you making small talk with strangers at a party or applying for a new job, she might feel more confident to follow your lead and take on new challenges. A person lacking confidence needs support -- to face new challenges and keep setbacks in perspective. Offer support to your friend by helping her think more positively about her situation, writes Burton. If she uses negative words to describe herself, such as "I can never do anything right," help her to question those assumptions and come up with more helpful statements: "I often do well at things I try." When mistakes happen, encourage her to see that these are temporary setbacks that do not define her. If she continues to struggle with confidence, she may need to see a mental health professional. Cuncic, Arlin. "How to Help Someone With a Lack of Confidence." Synonym, https://classroom.synonym.com/someone-lack-confidence-15766.html. Accessed 19 April 2019.